In January, someone moved into the house right next to Alex Nichiporchik's. Nichiporchik, CEO of SpeedRunners studio TinyBuild Games, immediately wasn't a fan of his new neighbor. "He decided it's a funny idea to throw parties every night until 3AM," Nichiporchik recalls. One month into this late-night party hell, TinyBuild signed a contract with Pinokl Games, a studio known for crafting family-friendly experiences. But Pinokl's new project was wildly different: Party Hard, a stealth game about skulking through a bumpin' party and murdering everyone there. "Coincidence? The final level is actually modeled against what I imagine the next door party is," Nichiporchik says. For the record, Nichiporchik isn't a murderer. He is a producer on Party Hard, a game that entered his life at a serendipitous moment and has helped him work through some frustrating emotions. Party Hard began life in a game jam, a rapid-fire game-making contest where developers generally build playable experiences in 24 to 72 hours. Party Hard's prototype attracted a fair bit of buzz. "To be honest we didn't expect it to get the attention it did when we built the initial prototype," Nichiporchik says. "The premise of Party Hard sounds very serious, but has been designed as a very light-hearted game. Everything from the visuals, to the sound effects, to what actually happens in the game was designed to be as silly as possible." Party Hard isn't meant to be a soulless murder spree -- it has mystery and a narrative, though Pinokl and TinyBuild have purposefully kept that quiet. They want players to be surprised by something other than the amount of stabbing required in the game. And there definitely is a lot of stabbing. On that front, the studios have received a fair bit of criticism from people who read the game's tagline, "A tactical game of mass murder," and assume the worst. "We had two camps of people: those who just read the premise and start to go off about the game being awful, and those who saw GIFs of dancing bears and realized the game is all about being silly," Nichiporchik says. "What we didn't reveal to anyone yet is the story part of Party Hard, which tells like a detective story of John West, the inspector in charge of Party Hard killings -- the story is told through his eyes. We're very interested what people think about it in contrast with the silly gameplay." 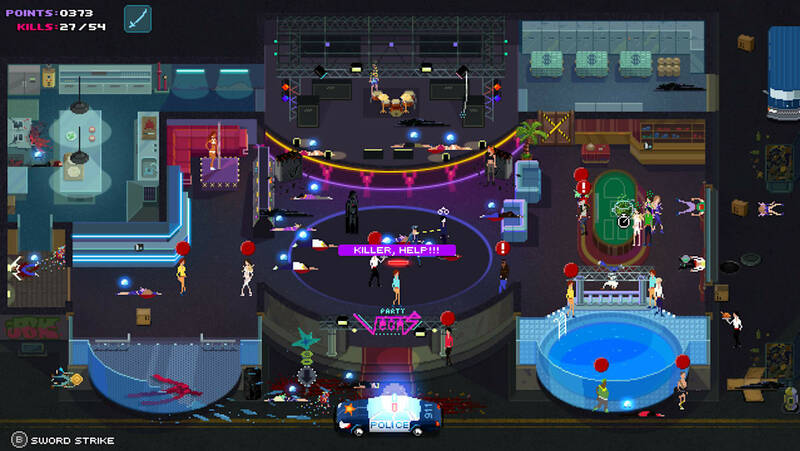 Plus, Party Hard gets even deeper as a live-streamed experience. It features special Twitch integration features that allow viewers to trigger certain rare, in-game events by voting on them in chat. These include an influx of killer bears, SWAT vehicles, firefighters, rioters or new items to buy. "Twitch integration was one of those things that we thought we'd try out, and make it a tiny feature in the game," Nichiporchik says. "Then we play-tested it and it was fun to play with just 10 people watching. Constantly having the odds flipped on the player is incredibly entertaining. So we decided to go full-on with the integration and designed a dozen different scenarios that fit in the game. Because of this nobody on the team had proper sleep for about a week." TinyBuild and Pinokl will see if their sleepless nights have paid off with Party Hard's launch today on Steam for PC ($10 in a release deal). However the sales shake out, Nichiporchik has learned at least one lesson while working on Party Hard. "Apparently if you call the cops for 10 nights in a row on someone, the landlords get notified."